In Star Conflict a small portion of the Galaxy known as Sector 1337 has become an endless battle ground as three powerful factions fight against each other in a bid to claim territory that can reveal information and technology of an ancient alien civilisation. In this battle among the stars Mercenaries are hired by Corporations to fight for these factions, choosing their alliances by politics, philosophies or simply who will pay them the most as they put their lives on the line in the name of profit. 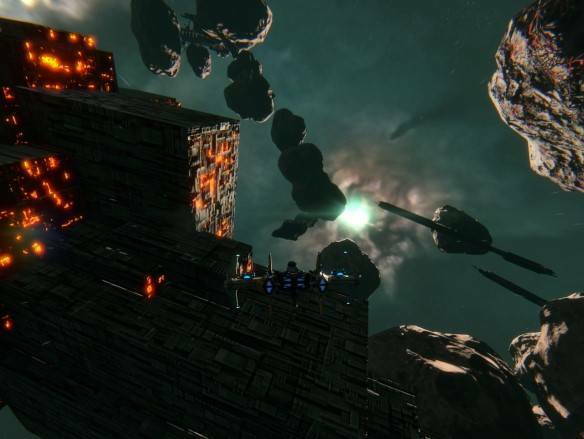 A fast-paced heart thumping space shooter Star Conflict puts players in the cockpit of their own starfighters, with high levels of ship customisation players will complete quests and seek out rival enemies to compete in PVP battles as either solo players or grouping together to join or create their own powerful Corporation. With stunning graphics and a highly detailed atmosphere ranging from a variety of space environments with natural terrain and structures forming interesting battlefields, players will feel immersed as they chase down enemy opponents exchanging laser fire in space based dogfights. The game is available on multiple platforms and is completely free to play. Of the starships that players can acquire and fly they primarily fall into three classifications, with each class having three sub ship types that fill their own unique roles. The Interceptor class is ideal for chasing down enemies or swarming them as a group using their speed and quick reflexes to get in and out of battle quickly, not staying around too long due to their low defences. The Frigate class is the opposite, using long range attacks and relying on its powerful Shields and strong hull, the ship packs a punch but lacks manoeuvrability. Finally the Fighter classes fit somewhere in the middle, considerably more balanced with a blend of decent defences, attack strength and speed they are a well-rounded class of ship ideal for medium range combat. Customising your own ship helps to give it a unique quality that can be made to better suit your preferred style of play, choosing which main weapon turrets to fit on your ship, what missile ordinance to store, whether to focus on engines, Shields or other characteristics are all choices that players must determine for themselves adding a level of strategy to their gameplay. Combat typically is broken down into PVE missions where players are tasked with taking out pirate strongholds or fighting off alien incursions, players can try to take on this content solo or have cooperative PVE with up to 4 players to a team. The game primarily focuses on PVP bouts with players choosing a variety of different team focused PVP game modes such as Team Death match, Point Capture, Capture the Flag and more. Alternatively those players that have formed a Corporation have the ability to fight against other Corporations in the Sector Control system where players will fight back and forth to gain control of specific key territories in an ever-changing map showing which of the three factions control which areas of Sector 1337.